Many people use echinacea to fight cold and flu symptoms. The herb has been heavily promoted as an herbal remedy that effectively zaps cold and flu bugs. But herbalists from the American Herbalist Guild say that echinacea has an even stronger talent when it comes to safeguarding your health. Their health advice? Use the herb to kill infections. “Echinacea was the preferred treatment for infections throughout the later part of the 19th century and the first 30 years of the 20th century,” according to the herbal scientists at the prestigious guild located in California. In fact, the herbalists say that taking echinacea as a cold and flu remedy is actually a misrepresentation. The herb has really been more of an infection-fighter all along and ought to be used as an antibiotic. RECOMMENDED: A Chinese herbal remedy for Alzheimer’s. Certainly, a study performed at the University of British Columbia bears this out. “Standardized preparations of echinacea contain potent and selective antiviral and antimicrobial activities,” the study concludes. In addition, echinacea displays multiple immune-modulatory activities. This, the researchers summarized, involves the stimulation of a particular immune function: the phagocytic activity of macrophages. Macrophages are special cells in your body’s bloodstream and tissues that engulf and ingest foreign particles, cellular waste material, and harmful microorganisms like bacteria. The next time you have an infection and don’t want to rush out and get antibiotics, give echinacea a try. Don’t forget to get your doctor’s advice before you try any herbal treatment. 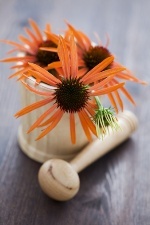 Tierra, M., et al., “Echinacea: an effective alternative to antibiotics,” J Herb Pharmacother. 2007; 7(2): 79–89. Hudson, J.B., et al., “Applications of the phytomedicine Echinacea purpurea (Purple Coneflower) in infectious diseases,” J Biomed Biotechnol. 2012; 2012: 769896.